Rad Studio XE2 introduced FireMonkey animation effects. A list of these effects, their description, methods, properties, and events can be found here. For each animation effect, Embarcadero also provides code examples. For example, for the TFloatAnimation effect, Embarcadero has provided five different examples at the bottom of the page. The simplest of the demos demonstrates how to make a rectangle fade from its original color state to transparent. This should work cross platform on Android, IOS, OSX, and Windows. However, below I have provided a simple demo of using the TAnimateFloat effect as well. 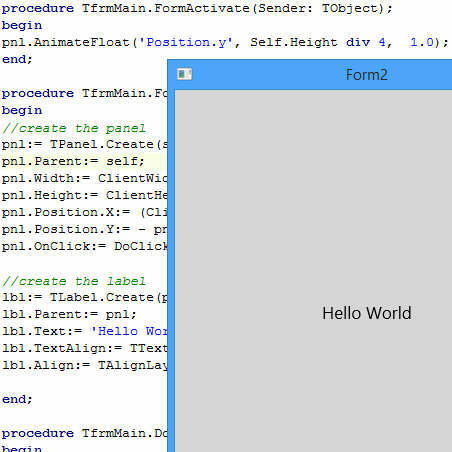 Unlike Embarcadero’s examples, this demo utilizes TFloatAnimation at runtime to make a “Hello World” Splash screen from a TPanel. Start by creating two controls (pnl: TPanel & lbl: TLabel) in the main form’s class. Add the following code to the form’s OnActivate and OnCreate events. In order to make the Panel reverse directions and go the other way, we will add an OnClick event for the TPanel created at runtime. Head over and see the other properties of TAnimateFloat.